Butch and his wing man, Duff Dufilho were launched from the Lexington. As the second wave of bombers approached, Butch and Duff realized that they were the only American fighters positioned to attack. They charged their machine guns and attempted to fire test bursts. Butch's four machine guns worked fine, but Duff's four jammed. It was this ship, the USS Lexington--his home carrier--that Butch O'Hare was defending when he dove into anti-aircraft fire on the mission that won him the Medal of Honor. Butch was back on the Lexington shortly after 5:45 p.m. He had shot down five Japanese bombers in less than four minutes. Up to this point, the war news had been consistently bad. Wake Island had fallen on December 23, Hong Kong on Christmas and Singapore on February 15. President Franklin D. Roosevelt realized that the country badly needed a live hero. 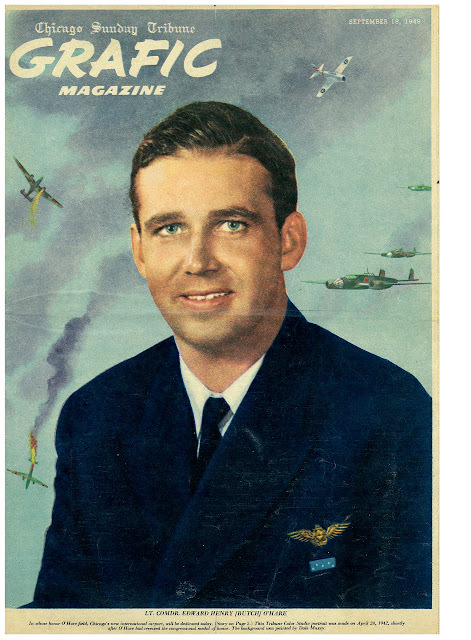 And Butch was a young, handsome naval aviator who had slugged it out with a superior Japanese force and won.